Stunning and unique duplex apartment with private roof terrace and fabulous views over the city within the Iconic Art Deco former lightbulb factory- Luma Towers. This truly is an unusual and fantastic place to call home! This duplex apartment feels spacious and bright with many quirky features to hold your interest - it comprises entrance hallway and stairs with generous storage cupboard, breakfasting kitchen with stylish white gloss units and another large storage cupboard - bathroom with shower over bath, and large bright living/dining room with huge windows over looking the city. Upstairs there is a very generous bedroom with fitted wardrobes- a really cute circular window to the south and large patio doors out to the private roof terrace which looks toward the QE hospital and to the North. 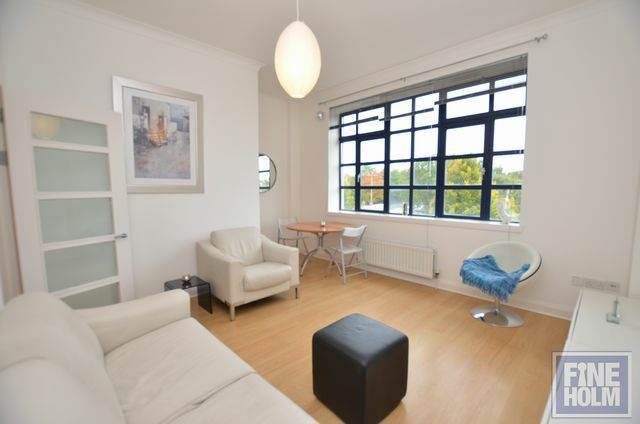 Although this is a 1 bedroom flat, it feels very spacious being over 2 levels- with the added benefit of a private rood terrace and private parking. GCH. Double glazing. Secure entry. Private parking. This is a perfect spot to call home particularly for someone working at the QE Hospital- just a couple of minutes walk away!